Yes, it’s true. Another tower defense game has been released. But it’s not just another TD. 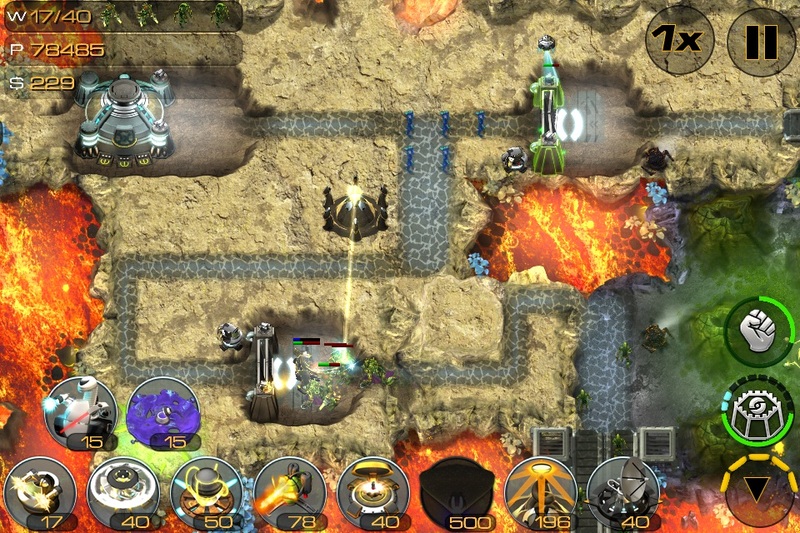 The Sentinel series is about as iconic and steeped in ios tradition as the tower defense genre itself. Origin8 is back with Sentinel 4: Dark Star ($0.99). Years have passed since Sentinel 3 ($0.99) and I am happy to see a number of improvements and an increase in depth in the latest iteration. Equipped with a new coat of paint and a fresh wax job, the series has set out to bridge the four year long gap. If you are new to the Sentinel franchise, welcome to the gold standard of TD ios games. Sentinel as a series has remained true to the TD formula and executes it solidly. Over the years Sentinel has been the mold that other games adhere to or break from. If you are looking to put a typical tower defense game on your mobile device, you are in the right place. The downside of this is that if you are tired of the genre I don’t know if you are going to find something refreshing enough to bring you back. The issue as I see it is that even four years ago when the previous game was released, tower defense games were old hat. The majority of recent titles have gone outside the genre to import new life into our trusty towers, but not so with Sentinel. If you played Sentinel 3, you are going to find the gameplay very similar. Yes there are a few new bells and whistles, but the biggest departures from stock TD that this game has are from Sentinel’s past. Previous versions introduced the command mech, which is a semi-mobile mech warrior style fighter that you can position near a wall or the base. Another feature that Sentinel 4 is bringing back is the drone system. Previously you had to decide between beefing up towers or bringing out drones, but they are now bought with the slowly building energy your base builds up which is a nice pacing change. Dark Star combines these features with a deep upgrade path for almost everything you do in game. I don’t mean increasing tower levels during a game, I mean there is a separate menu dedicated to permanent upgrades. Each tower, each sentinel skill, each selectable mech, and even wall structures can all be upgraded with the credits you earn in game. Additionally, the ability to salvage wrecked towers has a big impact on gameplay, keeping you in the game even if your towers start to go down. It is a great way to keep gameplay a little more dynamic. There are a few in app purchases, but they are non-intrusive and minimal credit packages, no coin doubler. Sentinel brings back it’s 4 difficulty settings from previous incarnations as well. Each one seems finely tuned. Hard can be a stretch, Medium makes you pay attention, but Psycho really tests your ability to micro manage. It’s not going to steal the lime light, but difficulty balance can easily break a game. Origin8 is too seasoned to let anything slip out of place, even with the deeper upgrade system that Sentinel 4 boasts. One thing missing from this latest release is the classic mode. Campaign has a brief yet contiguous story line that rolls along as you chart a course across the surface of the planet. Endless mode is alive and well, unlocking for each map as you clear it the first time in campaign. The overall interface has been reorganized to give a sleek minimalist journey from the splash screen to getting into the gameplay. I like the effect these changes have. You very fluidly go into the campaign without having to think much about which mode you want to do and endless mode opens up as a result. Some might miss the classic mode, but I think it was a good decision to bring the focus directly on the campaign. It funnels you right into the action without having to choose from multiple modes. A feature that didn’t make it but I wish had was the option to view other players’ map layouts. It would have been cool to see alternatives or more advanced strategies to help through some of those grueling psycho levels. There IS a serious amount of refinement that has been built into Sentinel 4. I can’t fault origin8 for sticking to their guns in an aging pile of TD games, although I would have really liked to have seen a bigger emphasis on innovation. Staying confined within the genre was probably a conscious design decision. As noble an idea as it sounds, the game feels a bit dated because of it. Some people may have lost their taste for pure tower defense, but for those of us with an appetite there is still meat on this dinosaur’s bones.